HomeTechCES 2019 was absolutely buried in laptops and PCs – why? CES 2019 was absolutely buried in laptops and PCs – why? At CES 2019, we’ve experienced an absolute deluge of laptops and other computers that made this year’s show feel more like Computex than the Consumer Electronics Show. That’s not even on account of Nvidia’s big push into RTX graphics on laptops. Not counting the 40-some new gaming laptops on display at the show, we easily saw another 40 general use laptops this year – and almost all of them would have been worth deeper coverage had we not forgotten to clone ourselves before landing in Las Vegas. Just three years ago, the popular opinion was that laptops and PCs were dead in the water, that you should sell your stock or just pick up a tablet. So, what’s up with this explosion in laptop production for 2019? Mark Linton, GM of OEM Portfolio and Product Management for Microsoft, gave us a few of his ideas at the company’s media showcase in Las Vegas. Who better to ask than someone who’s working with all of these laptop makers every day? Huawei’s MateBook 13: an example of PCs’ steady uptick in power and design quality. Ding, ding, ding – we have a winner. Yes, the advancements in processing and a steady rise in Windows 10 adoption are contributors. However, Microsoft stopped pushing feature updates to its almost 10-year-old operating system (OS) back in 2015, and support for Windows 7 security updates will end on January 14, 2020. This is a much more plausible explanation for the explosion in new laptops for 2019. You might be thinking, “Wait, why didn’t all these people just upgrade to Windows 10 when it was free?” Well, then you’re not the average computer user. The vast majority of computer users don’t pay much attention to such things as OS updates. Samsung certainly seems ready for this with the gorgeous, budget-friendly Notebook Flash. It appears that hardware manufacturers the world over are preparing to be there for the time when users finally notice that their aged Windows 7 device isn’t receiving updates at all. How Microsoft will ultimately communicate this to users is unknown, but surely the company will do everything in its power to ensure its warnings are heeded. 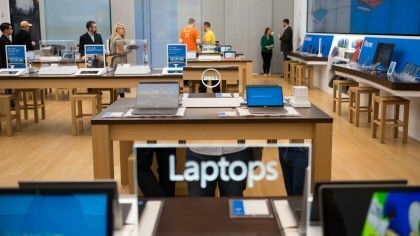 Microsoft clearly has been preparing for this moment, working more closely than ever with laptop makers to produce more attractive options at all ends of the budget spectrum. If you know someone in your life that’s still rocking a Windows 7 laptop or PC from a few years back, give them a gentle nudge and tell them it’s time to upgrade. Even at the budget level, comparatively, they’re in for a massive boost. Will Fortnite Continue Its Upward Curve in 2019?